It’s summertime, so everyone, everywhere is swimming. If you are a parent, water safety is likely on the forefront of your mind. After all, drowning is the top preventable cause of death for children. According to the CDC, about 800 children are still dying annually from drowning. That number doesn’t even come close to the startling amount of children who are injured, sometimes permanently, but do not actually die from drowning. Parents want to keep their children safe in the water, but every time I go swimming, I see kids in the pool with one of the most dangerous swim toys. It makes me sad, nervous, and completely on alert. This dangerous toy? Floaties. Also knows as arm floaties, swim floaties, or water wings. If you own this toy, find it now, and promptly throw it away. Notice how I keep calling arm floaties a toy? You should, too, because that’s what they are. Floaties are not a water safety tool or a life-saving device in any way, shape, or form. Floaties are dangerous. They WILL find a way to take off anything you put on them. Everything. Diapers, clothes (can’t blame them there), car seat buckles, you name it, they WILL figure it out. Children will learn how to remove their floaties. It’s not a matter of if, it’s a matter of when. You don’t want your child to figure out how to take floaties off for the first time when you have your back turned for mere seconds. Arm floaties are notoriously easy to remove and extremely dangerous, but I’ve also seen children harmed from the newer floaties that buckle behind a child’s back. All they need to do is wiggle out them, or have help from a little friend to unbuckle them, and they are in immediate danger. Just a few days ago, a friend of mine experienced the drowning of her granddaughter after she unknowingly removed her floaties and slipped under the water. It was traumatizing, but thankfully, she escaped without permanent harm. Floaties are causing drownings like this every summer. 2. Arm floaties are silent. When children do figure out how to take off their floaties, it will be silent. You will not hear anything. All a parent can do is pray to God they learn this new skill while you are watching. Need to grab something? Turn around to find your other child? Look for sunscreen in your bag? That’s long enough. It only takes a minute, sometimes even seconds, for children to take floaties off and slip under the water. You will not hear a thing. 3. Your child will likely be confident when they are in danger. We call it a false sense of security. What do floaties teach a child? Jump in the water and you will come bouncing up buoyantly to the top. However, small children don’t necessarily understand that this fun floating ability is dependent upon them wearing the floaties. When a child jumps into the water and comes springing up to the air completely by means other than their own, what would you expect? Why would they know differently? Many children have been wearing unsafe floaties since they were infants first entering the water. There is no substitution for watching your child at all times and teaching them how to swim to the top of the water by themselves. 4. You will likely be confident when your child is in danger. Can I tell you something really important? Wonderful, extraordinary parents have been present when their child has drown. You are not exempt. Nine out of 10 children who’ve died in the water were being watched by an adult, according to Safe Kids. We have to evaluate why this is happening, and I know unsafe floaties are undoubtedly contributing to this problem. You don’t know your child can take off their floaties – until they can. You will have your eyes glued on the pool – until you get momentarily distracted and don’t. 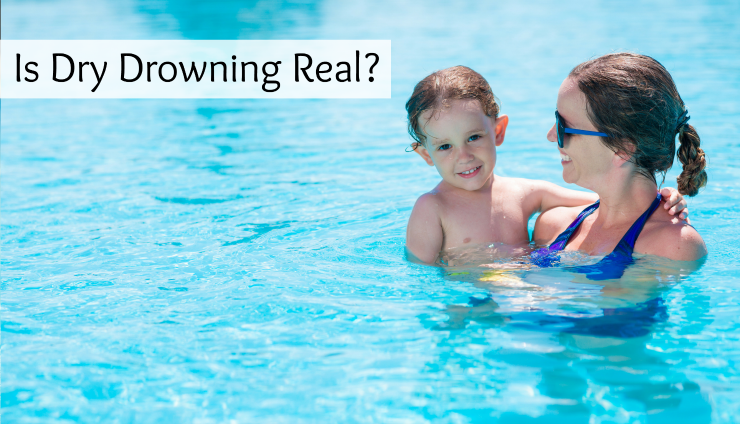 It’s not just your child who will gain a false sense of security from floaties, it’s you, too. Anything that lessens our best defense to prevent drowning by being alert and constantly watching our children by water, even heightened confidence, is a major problem. The water safety solution? It’s simple. Throw away your floaties. Now. Keep your eyes glued on your children around water. It’s never a bad idea to hire a lifeguard for your next summer party. Also, whoever is dedicated to watching your child, cannot be drinking alcohol. Sign your kids up for swim lessons today. Teach your children to swim now, and start from as young an age as possible. Did you know children can actually learn to swim before they can walk? Most swim lessons can start as soon as 6 months. Don’t wait any longer. It’s not worth it. If you feel like you absolutely need to use floaties in the interim, before the swim lessons have fully sunk in, it is crucially important to buy a Coast-Guard approved flotation device that fits your child’s body correctly. Use it as a stop-gap until your child can swim on their own, not as a crutch to avoid teaching them this important, life-saving skill. Learn CPR. This won’t prevent the devastation of a child drowning, but it might prevent the devastation of death. “I wore floaties when I was a kid, and they were great.” We know better, so we do better. “But, she is just too little not to have them!” The confidence your child is learning in the water is false, and dangerous. “I feel better when my child is wearing swim floaties.” That is exactly the problem. “I’m just going to use them a little longer until he learns how to swim…” Again, the problem. Teach your child to swim now. Here’s one more thing to think about when you consider allowing your child to use floaties: in the World Health Organization’s 2014 Global Report on Drowning, swim aids were NOT included in their list of the top 10 actions that can prevent drowning, because people still drown while wearing life jackets and flotation aids. Water safety isn’t a game, so there is no room for toys in your safety plans. For more water safety tips, read my blog post about dry drowning and find out the facts about this over-hyped water safety threat.